Do not use for navigation these pages are for historical research only. U.S. Air Service, Vol. 8, No. 9, September 1923, page 5: (advertisment) Photo of U.S. Air Mail Field, Cheyenne WY. 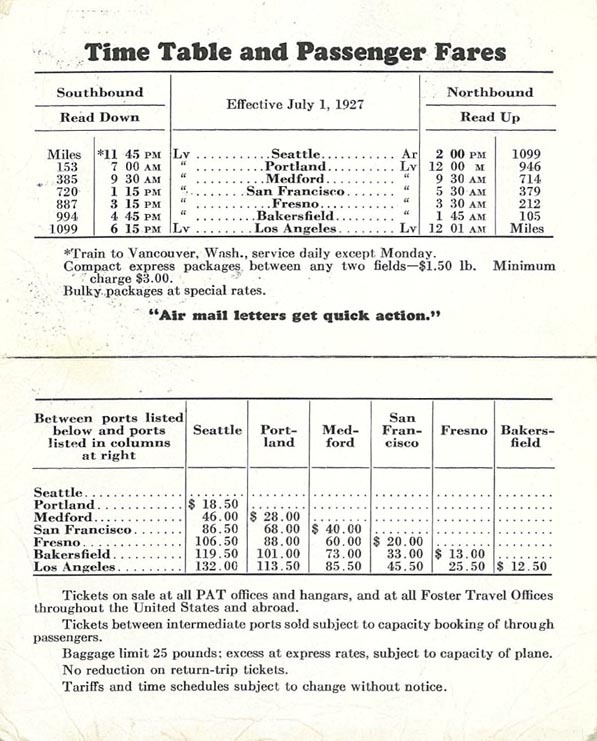 Overnight Air Mail Service between New York and Chicago, to start early next spring, was announced, recently, by Carl F. Egge, General Superintendent of the Post Office Departmen's Air Mail Division, who has just completed his report to Col. Paul Henderson, Second Assistant Postmaster General, embracing plans for illuminating the 780-mile route and working out emergency landing fields. U.S. Air Service, Vol. 9, No.6, July 1924, page 7-15: The First Night Airways, Lieut. D. L. Bruner and Liewt. H.R. 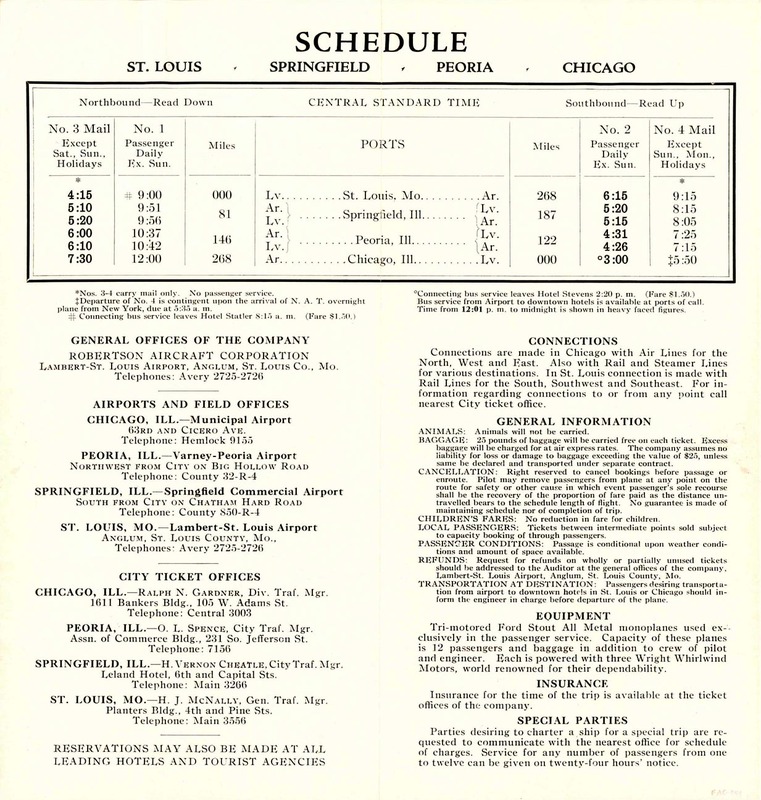 Harris A.S.
Boston to New York Via Hartford: The successful bidder is Colonial Air Lines, Inc., Naugatuck, Conn.
Chicago to St. Louis via Springfield: The successful bidder is Robertson Aircraft Corporation, St. Louis, Mo. Chicago to Dallas and Ft. Worth: The successful bidder is National Air Transport, Inc., of Chicago, Ill.
Chicago to Birmingham: No award. Chicago to Saint Paul and Minneapolis: No award. Salt Lake City to Los Angeles: The successful bidder is Western Air Express, Inc., of Los Angeles. Elko to Pasco: The successful bidder is Walter T. Varney of San Francisco, Calif.
Seattle, Washington, to Los Angeles: The bid of Vern C. Corst (Gorst) is now under consideration. At the present time there are 324 Department of Commerce intermediate landing fields in operation throughout the United States, which, in the aggregate, represent a substantial engineering task on the part of the airways division of the Aeronautics Branch. Eighty of these fields were completed during the past fiscal year, the completion of which required approximately 156 contracts for grading, seeding, removal of obstructions, installation of drainage systems, construction of fences, and similar work. When the airways division first was established, the practice of the Post Office Department airmail service was followed for the reason that this was the only organization in the world which had laid out intermediate landing fields and airways. 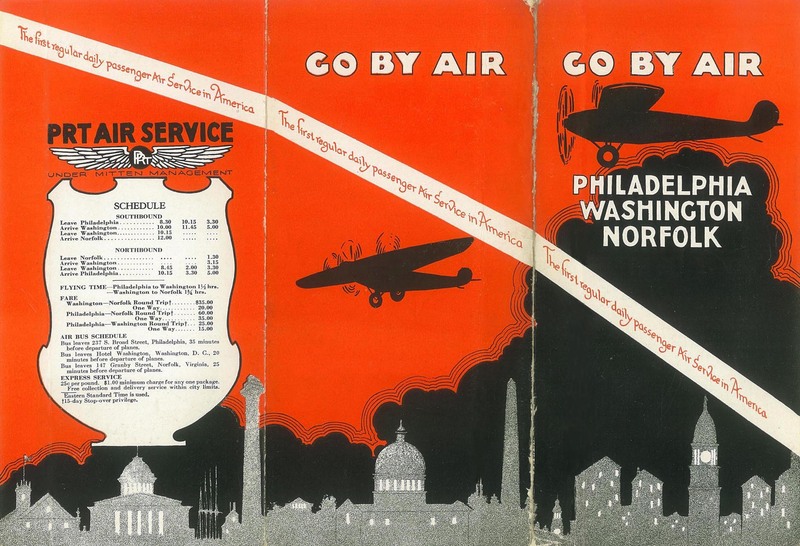 Under the air commerce act of 1926, the Post Office airways were turned over to the Department of Commerce for future maintenance. 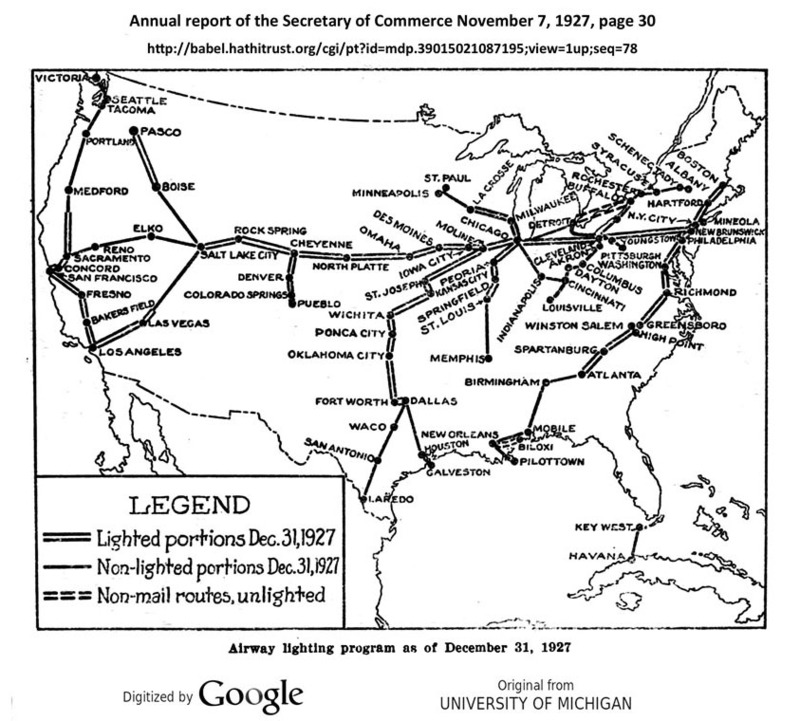 The first airways were established in open country where natural landing fields could be found. The first intermediate landing fields were, in effect, any 40-acre tracts of ground which could be utilized in their natural state, and which could be selected on the line of the airway at proper intervals. It was intended that by the installation of lighting equipment at these sites, they could be used to furnish suitable emergency landing areas, without further conditioning work other than removal of fences separating adjacent tracts of land and other work of inconsequential nature. The original estimates for work of this type allowed approximately $500 per field. It did not take very long to outgrow this practice, as it soon became apparent that the airways division could not hope always to find such natural landing fields. This became more certain as the need for larger fields became more pronounced. When the work was extended into mountainous country it was found impossible, in many cases, to secure natural sites of sufficient size for the aircraft being flown over the route. This led to the undertaking of certain conditioning and grading work by the airways extension superintendents assigned to the various airways. As operations were expanded, it became evident that the services of men especially trained for work of this nature were needed. Accordingly, a number of engineers were employed, these engineers being assigned to certain sections of an airway to superintend grading and conditioning of fields, the removal of obstructions, and work of like nature. This relieved the burden of conditioning work from the extension superintendents, who were essentially pilots with some degree of surveying knowledge, and enabled the airways division to make further use of their aeronautical experience in preliminary survey work. It was also intended to assign engineering personnel to assist the extension superintendents in the selection of fields, with a view to obtaining sites with better natural drainage and lower conditioning costs. This could not be done at first as there were a great many fields waiting to be conditioned, and it took quite a while for the construction of fields to catch up with the preliminary surveys. Under the general procedure in work of this nature at the present time, an airways extension superintendent, with an airways division plane, is assigned to make a preliminary survey of a certain route. The extension superintendent flies this section of airway, notes the general type of terrain and natural features of the ground, the existence of power lines, roads, and other features which will assist him in determining the selection of sites. The ground survey is then made and field sites tentatively selected. The extension superintendent informs the engineer of the sites which he has in mind, and may call on him to make surveys to determine their adequacy with relation to costs, which would involve an estimate of the amount of earthwork involved, and a study of the drainage situation. Equipped with this information, the extension superintendent proceeds to negotiate with the property owners, and when suitable agreement is reached, forwards this information to the office of the airways division. If the tentative selection of sites is approved, the extension superintendent negotiates licenses for these sites, calling on the engineer to furnish him suitable legal descriptions of the fields. The engineer runs suitable traverse for this legal description, stakes being set, which he will later use in connection with the conditioning of the field. If time is available, the engineer will make complete a topographic survey of the field, and obtain other data necessary for the preparation of proposals and specifications under which the conditioning work is to be performed. All throughout the progress of the preliminary survey the engineer, in addition to assisting the extension superintendent, is able to gather such information as will assist him when conditioning work is started. The assistance of the engineer also enables the extension superintendent to complete the preliminary survey in less time than would otherwise be the case, as the airways extension superintendent is furnished a traverse of the field site in question, from which he may prepare the legal description. The airways extension superintendent may also call on the engineer to furnish him comparative costs of conditioning alternate sites which may be under consideration, and other information which may aid him in dealing with property owners. After all sites on an airway have been approved by the executive board of the Aeronautics Branch, Department of Commerce, and field licenses accepted, the engineer proceeds immediately to issue proposals and specifications for such work as is necessary to place the fields on his section in proper shape for use as intermediate landing fields. These proposals and specifications are forwarded to the office of the airways division, together with drawings, topographic maps, and such auxiliary information as may aid the office in determining the amount and nature of work to be performed at each site. The proposals and specifications are revised accordingly and returned to the field engineer for advertising. The work is then advertised, bids are opened, and forwarded to the office of the airways division for award. After such award is made, the engineer notifies the successful bidder to proceed. This work is carried on under the direct supervision of the engineer assigned to that section of airway. There may be five or six fields under construction at one time, in some instances more, and the engineer drives back and forth between the sites and instructs various contractors relative to the prosecution of the work. The fields are graded, not only to limited sharp grades, abrupt changes in slope, and reversals in side slope at the runways, but also to secure surface drainage. Tile is installed under the fields where necessary, suitable drainage ditches dug around the fields and revetments placed to hold the fills. In some cases, small streams are diverted and their waters carried by suitable pipe lines to new outlets. Once it was necessary to pipe water from a drainage area of 600 acres under a field in order to provide a satisfactory runway. In other instances, levees are thrown up to prevent the inundation of the fields due to flood waters at certain periods in the year. Trees are removed and their stumps grubbed out of the field, and trees and other obstructions removed on adjoining property, if these obstructions are within a seven to one gliding angle. Arrangements are made with telephone and power companies for the removal or lowering of their lines. After completion of the grading and smoothing work on fields, steps are taken to prevent the formation of washes. In most instances, this means a good sod must be obtained after grading operations are completed. The soil and climatic conditions are studied with a view to obtaining a sod in the shortest possible time. In addition to this sod, revetments must be placed at times to hold the fills in place, and in other cases, brush dams are added to aid the accretions of soil to fill in low spots and to break up the tendency of washes to form at certain places. After the contract for installation of lighting equipment has been awarded, the engineers assist the representatives of the construction section in certain phases of their work. In cases where it is not convenient to include the field circle markers and border markers in the contract for lighting installation, separate contracts are let by the engineers for this work. In addition, many other miscellaneous jobs are performed by the engineers, mainly in connection with the furnishing of information to the office. An example of this type of work is the determination of the visibility of revolving beacon lights and the removal of trees from intervening ridges to secure this proper visibility. As this work of conditioning fields extends over the entire United States, every conceivable condition of climate and soil is met. Nearly all intermediate fields are limited by the tracts of ground which can be obtained at a fair rental. In the selection of intermediate fields, soil characteristics are of primary importance. The proper selection of sites with this in mind results in lower conditioning cost. A certain amount of porous material, combined with a natural binder, is to be desired. An impervious subsoil located close to the surface is to be avoided, gravelly subsoil being most suitable. If the site is selected with these points in mind, artificial drain- age may not be necessary. Ditches, filled with gravel, afford a means of disposing of surface water when placed judiciously and act as a preventive measure to the formation of washes. In a great many instances tile must be installed. The trench in which these tile lines are placed are frequently back filled with gravel. In some cases, gravel is placed around the pipe and sumps filled with gravel extended to the surface. About every possible combination of catch basins and pipe is used. If the volume of water to be carried off is considerable, perforated iron pipe may be used. The assignment of engineers to preliminary surveys, in addition to speeding up the conditioning the fields, has materially expedited the installation of lighting equipment by decreasing delays occasioned by the arrival of the equipment contractor at a field site before the boundaries of the field are in proper shape for cable to be laid. In most instances, field conditioning is well in progress by the time the lighting installation contract is awarded. In addition to the 324 intermediate fields now in operation there are 46 in various stages of construction. Approximately 90 fields will be completed this fiscal year. The construction of these fields will involve moving approximately 300,000 cubic yards of earth, the laying of 11 miles of various sizes of pipe and tile, the construction of 120 miles of fences, 30 miles of ditches, 1,800 sets of field border markers, and the clearing of approximately 500 acres of timber at a total cost of $200,000 to the Government, and $80,000 to cooperating municipalities.